This iExpression creates a text that can be used as a counter to create, for example, a countdown. The iExpression has some similarities with the effect Numbers, but offers several advantages: 1) numbers larger than 30 000 can be created 2) the decimal marker symbol can be configured freely 3) an optional thousands separator symbol can group the number into blocks of three digits 4) you can add text before and after the actual number 5) it works directly with the source text property to text layers instead of an effect on a solid layer. normally 1. If you enter, for example, 1000 the number shown by the counter is 1000 times as large as the value of your linked slider. 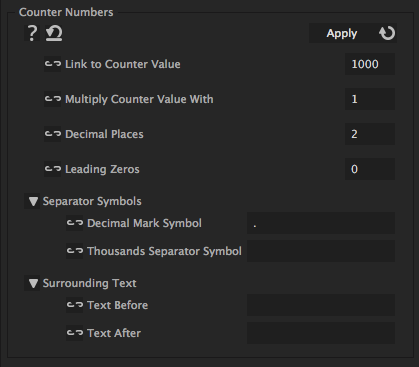 This is useful if you need to create numbers that are larger than the value range of slider controls.